Discussion in 'MOC 2019 Challenges' started by ashleywb, Jan 26, 2019. Welcome to day 26! The end is in sight - which is both kind of exciting and kind of sad. I hope you enjoy today's challenge which incorporates a photo coloring technique. I sometimes look to the graphic design and advertising world for scrapping inspiration. One trend I've seen in both web design and print is the use of bold two-color images. There's a word for these images: duotone. Duotone is just what it sounds like - an image composed of two colors. Historically, duotone images were created on printing presses using 2 shades of one color, or black and one tint. In the digital age these images have branched from the traditional print technique to also using two complementary colors or two contrasting colors. Your challenge today is to scrap a photo that you have converted into a duotone image. As with most things in scrapbooking, there are multiple ways to achieve the effect. Today I will show you how to get the look using gradients. I am using Photoshop CC. First choose your photo. A fairly simple photo with high contrast is probably going to be your best bet. I selected a photo I took of my daughter playing her violin. You may want to make a copy of your photo and hide the copy before you start working. 1. Pull your photo into your workspace. With the photo layer highlighted Go to the Layer menu and choose New Adjustment Layer - Gradient Map. 2. You'll get this little dialogue box. Just click OK.
3. 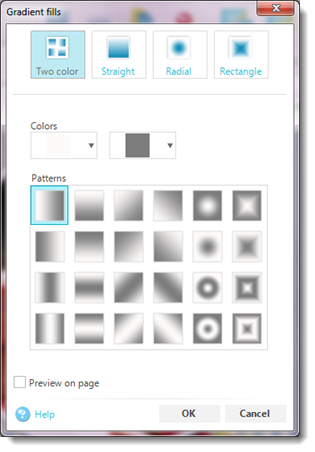 Once the layer is created, double click on the gradient scale in order to manipulate the colors. The gradient editor will open. There are four boxes - one each at the corners of the gradient scale. We will be using the bottom boxes. By clicking on the bottom left one I can select a color to replace black (for the darker portions of my photo). Clicking on the bottom right square allows me to choose a color for the highlights in the photo. It's pretty fun to play around with the color combinations. 4. 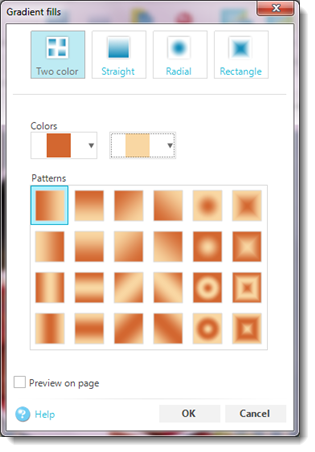 Click on the bottom left square of the gradient scale and choose a color. 5. Repeat the process for the bottom right square. 6. You can grab either of those two boxes and slide them along the scale to create the look you desire. * If you are not getting the look you want, try a different photo. Remember to keep it simple and use a photo with high contrast. 1. Convert a photo to duotone and scrap it. You may have multiple photos on the page, but one must be a duotone photo. 2. You may use black OR white as one of your colors, but not both black AND white. While black & white may technically be duotone, the point here is to try something new. Gradient maps are available in PSE and Artisan. @JillW has created the look in Corel Paint Shop Pro. If you have questions about your software capabilities, post here and hopefully we can get fellow scrappers to offer assistance. Ok, that's a lot of information! I hope you have fun with this. Can't wait to see your pages. DenetteS, honeyandcheese, michelepixels and 2 others like this. Updates and clarifications will be posted here as needed. Q. Is it permissible to change the photo to black & white first. A. Yes, you may change the photo to black and white as a step in the process. However, the final photo must have color (two colors). One of those colors can be black or white. Q. Is further editing of the photo permitted? A. Yes, blending and other techniques are OK as long as the duotone technique is obvious. Please, try to keep with the spirit of the challenge - 2 colors clearly evident in your converted photo. I can't see any of the samples. Hmm, ok. Let me work on that. A-M and amien1 like this. all of them show now for me. Thank you! Thank you! They are working now! These are the challenges I find the hardest with knowing what photo I should choose to work with. I have been doing some playing and I want to make sure about what I am doing. Before I add the adjustment gradient etc.... I have changed my photo to black and white and like the look of what I am achieving. My question: is it permissible for the challenge to change the photo to black and white first ? Yes, you can change to black & white as one step in the process. But your finished product should include color. Black or white can be one of the colors. Does that make sense? bonnenuit Why do I always have to be Captain? I'll be interested in seeing any Artisan tips on how to use the gradient on a photo. Looks like fun. I'll have to play tomorrow. Select the element in which you want to fill. Note: " style="box-sizing: border-box; margin-bottom: 8px; margin-top: 8px; background-repeat: no-repeat; background-image: url("../../Images/help-hint.png"); border-style: solid; border-width: 1px; border-color: rgb(176, 196, 222); color: rgb(105, 105, 105); border-radius: 6px; padding: 10px 10px 10px 40px; background-color: rgb(255, 239, 213); font-family: Arial; font-size: 16px;">Note: Only simple images can be filled. If you try to fill a complex image, you will be prompted by Artisan to flatten the image. See Flattening an Image for more information. Click the Format ribbon tab, then click Gradient from the Fill section. 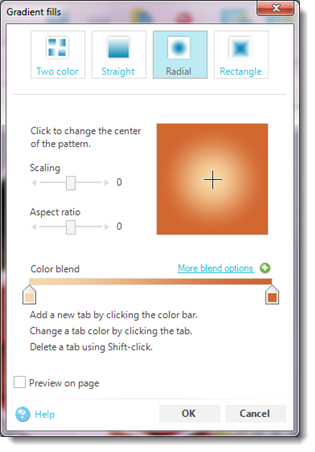 The Gradient dialog box appears, listing the available gradient options. Allows you to choose two colors to blend. Each color must be selected separately (click OK to select the second color). 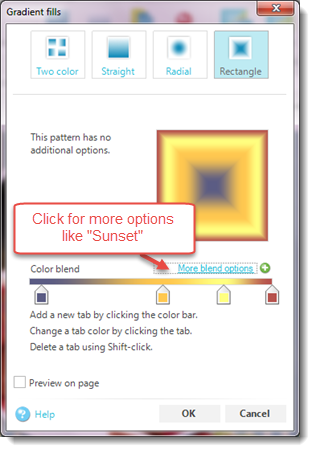 Allows you to choose two or more colors to blend in a straight pattern. 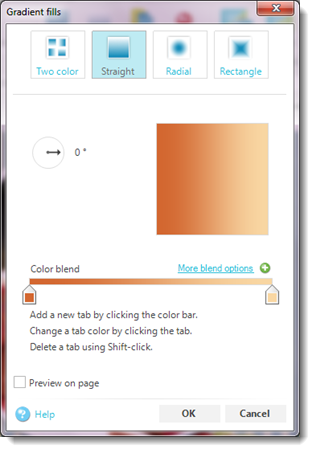 Click the tabs on the slider to pick a color for each. You can also add new tabs. The More Blend Options allows you to choose from pre-designed blends. 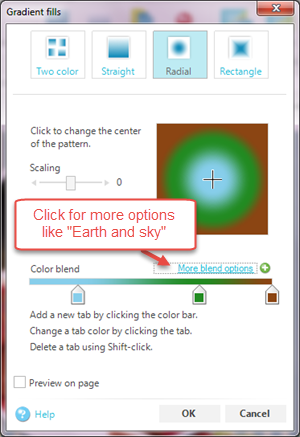 Allows you to choose two or more colors to blend from the center out in a circle pattern. 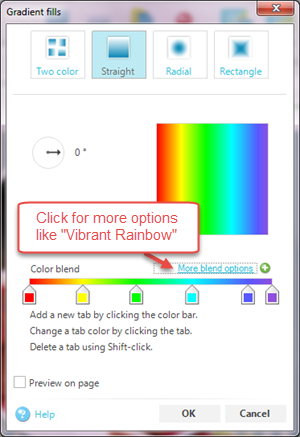 Click the tabs on the slider to pick a color for each. You can also add new tabs. The More Blend Options allows you to choose from pre-designed blends. 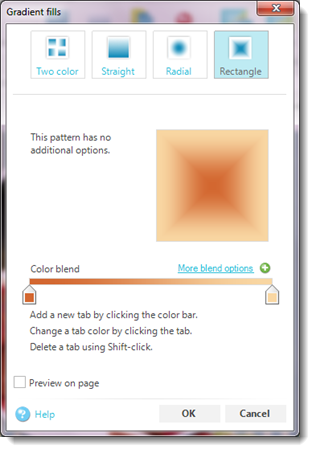 Allows you to choose two or more colors to blend from the center out in a rectangle pattern. Click the tabs on the slider to pick a color for each. You can also add new tabs. The More Blend Options allows you to choose from pre-designed blends. Found this link - if you scroll down a bit there is a section on using colors with gradients. Yes, this I know. The key word in this is FILL. It does not recolor a photo, it fills it with a color gradient and no photo image is there. Oooh! This sounds crazy fun! I've never done anything like this...I have PSE 7, but your tutorial looks like I should be able to do it! Thanks so much! Can't wait to play tomorrow! Oh, I see what you mean. Maybe @BevG can weigh in on this?